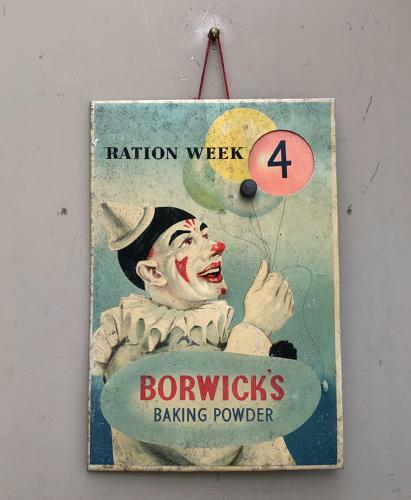 A rare 1940s Shops Tin Advertising Sign - Not only advertising BORWICKS BAKING POWDER but the Current Ration Week. Brass knob at the top to turn and the Ration Week turns turns from 1 to 4. Obviously pretty dreary times and so displayed as a cheery clown with the weeks as balloons. I have never seen or had one of these signs before. There is a stand at the back which pulls out so it freestands and the original cottton to wall hang.